In the weeks following the emergency period of an acute disaster, such as an earthquake, health sector needs change rapidly. 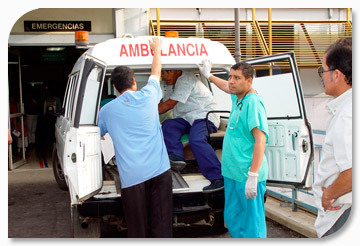 The demand for emergency care, for example, is replaced by a need for primary care, while in the area of surveillance, the acute phase of monitoring diseases from sentinel posts is gradually replaced by traditional monitoring, although attention to changes of epidemiological behavior of diseases continues. Health-related needs and environmental needs increase, as does attention to the needs of populations in camps or temporary settlements. Decision-makers must consider the nature and behavior of disasters (earthquakes, volcanic eruptions, and some floods are sudden-onset in nature, while drought becomes evident slowly) in order to properly identify needs for early rehabilitation, since each disaster has its own characteristics. However, it is important to emphasize that there is no clearly defined line between the emergency phase and the rehabilitation phase. This is especially true in acute disasters, and therefore it is advisable to plan for rehabilitation needs during the emergency phase, based on a rapid damage and loss assessment. Health authorities and the technical teams responsible for the rapid health response to a disaster will collect data the earliest data on health conditions in the disaster-affected area, which they will subsequently to those responsible for evaluating the overall impact of the disaster. It is important that they present a clear picture of damage and losses, since this information will form the basis for planning to address short-term needs for the functional rehabilitation of essential services. The initial evaluation by the rapid response team will also serve as a baseline for a socioeconomic assessment of the disaster’s impact at a later date. It will also guide the preparation of plans for physical and functional recovery and to base cost estimates that will be incorporated into funding requests. Read more about the health sector post-disaster needs assessment (PDNA) here. Effects of the disaster on public health. Operating capacity of health facilities and networks in terms of physical infrastructure, equipment, and operation of vital services (water, electric power, communications). 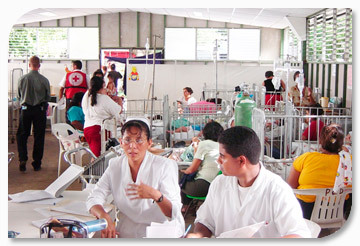 Operation of essential health programs, in the areas of both medical care and prevention. Needs for water and basic sanitation services, including hospital waste disposal. Operating capacity in the form of sufficient human resources for health services. Once the immediate response phase and the sector’s initial damage and needs assessment have been concluded, an assessment to determine the socioeconomic impact of the disaster on the health sector is advisable. An assessment of this type, based on the methodology developed by the Economic Commission for Latin America and the Caribbean (ECLAC), will determine the needs and priority areas for reconstruction as a function of the damages and losses in the sector. Consult the ECLAC Handbook for Estimating the Socio-economic (including health) and Environmental Effects of Disasters. Once this has been completed, proposals for rehabilitation and reconstruction projects can be developed. Once the acute emergency phase has passed, the continued treatment and rehabilitation of patients remains a key priority. This requires full access to health services. However, a return to pre-disaster levels of medical care at health facilities is often seriously hampered as health facilities find their operational capacity affected by the impact of the disaster on infrastructure and essential services. 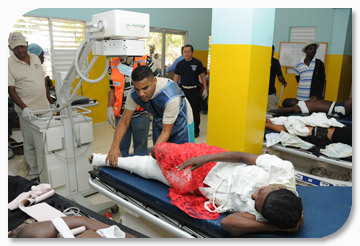 Structural rehabilitation of health care facilities, including primary care facilities. Basic equipment for diagnosis and treatment. Restoration of the normal operation of water, power, laundry, and communications services. Restoration of basic operations in public health laboratories. Inputs for preventing and controlling diseases that have the potential to become epidemics. Read more about the importance of laboratories in disaster situations. To the extent possible, efforts are needed enable the population that has been located in temporary settlements to return to normal activities as soon as possible. However, there are often problems and limitations—particularly as regards housing. Ensuring that ongoing medical care is available. Monitoring and adequate food supply and proper nutritional levels. Continuing preventive mental health activities. Monitoring and control water quality and ensuring there is sufficient sufficient supply of water. Prioritizing the repair and restoration of supply sources and primary and secondary networks, which require equipment, materials, and experts. Repairing wastewater and sewage networks in areas at greatest risk. Providing for disposal or treatment of hospital waste, in light of the potential risk of contamination to the environment. A country’s financial resources destined to cover routine health programs are usually quickly exhausted in emergency situations. This includes funds allocated for emergencies, and it is not easy to obtain supplementary resources. As requests for emergency support from the international community are being prepared, health officials are advised to incorporate line items covering the needs for immediate and short-term rehabilitation of infrastructure, programs, and services where damage assessments show that operational rehabilitation is feasible. Aid agencies are more amenable and sensitive to requests for assistance during the emergency phase. Thus, requests for assistance should include needs that are projected to be present in the immediate post-emergency period. It is important to assess the functional capacity of the entire health network, including not only large hospitals, but also primary care facilities, many of which can be rehabilitated in the short term with relatively little investment (facilities that have sustained complex damage require more detailed consideration in the reconstruction phase).